stay informed about the human rights situation in Iran! Internet , is a dog with rabies and must be kept in leash ! The latest reaction of the officials against online media was the comment by conservative MP Mr. Yahyazadeh Jalal who have compared internet as " dog with rabies" . He said: " If newspaper write ' not suitable ' topic , there are ways to make complaint or to stop it for doing, but there are topics in blogs which insult Islam and to the system ." He added: "So should we not prevent the internet. Internet is like a dog with rabies we released and now we have to keep it in leash." 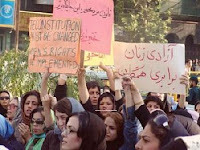 (New York, October 28, 2008) – The Iranian government is escalating its attacks against women activists, subjecting them to arbitrary detention, travel bans, and harassment, Human Rights Watch said today. On October 26, 2008, security agents blocked Sussan Tahmasebi, a leader of the One Million Signatures Campaign for Equality, from boarding a plane and confiscated her passport, without charging her with any crime. At her home, they confiscated her computer and demanded that she report to court for interrogation. The government has prevented Tahmasebi from leaving the country for the past two years, but has never brought charges against her or provided a reason for her travel ban. “Instead of seeking to silence women’s rights advocates who draw attention to the urgent need for reform, the government should move to repeal Iran’s discriminatory laws,” said Sarah Leah Whitson, Middle East director at Human Rights Watch. Human Rights Watch said the Judiciary has prosecuted more than 100 women’s rights activists over the past three years and continues to detain, intimidate, and prohibit from traveling a number of other women’s rights activists, particularly those involved in the One Million Signatures Campaign for Equality. The grassroots campaign aims to raise awareness of Iranian laws that sanction discrimination against women, by collecting 1 million signatures throughout the country in an effort to repeal them. 100 Million Tuman ($100,000)bonus package for Islamic Republic MP's ! Ten MP's have sent a complaint to the judiciary and demanded punishment for an Mp ( Mr. Hasan Kamran -MP from Isfahan) who have revealed to the public about 100 milion Tuman bonus each MP's have received. The ten MP's beleived that the bonus must have been kept secret. The country has changed to a graveyard and prison. According to the report by Amirkabir newsletter Amirentezam said: There are so many things that i want to say or write one day, if i live long enough. He said: For change in Iran two factor is needed: 1- The change in the world 2- The readiness of internal situation and the people get ready to pay the price. He added : For change Nelson Mandela didn't use the violent way but instead he waited until the situation has changed. For change we have to use peaceful means, he said. Websites to register and follow by-laws! "With all the dificulties we had at present , the only things we could do was to say that, the websites to register . In our opinion if the websites do register themselves and follow the government by-laws , it is a progress ." IRAN WATCH CANADA and the human rights situation of national minorities in Iran! Mohammad Sadigh Kabudvand is the president of the "Organization Defending Human Rights in Kurdistan ". He has been sentenced to 11.5 years in prison. 10 years prison for creating the "organization defending human rights in Kurdistan", 1 year for propagating against the Islamic Republic and 6 months for creating public unrest through " Payam Mardom " Weekly. His sentence was issued by the "court of revolution" and "Ministry of Information". Mr. Kabudvand sent a letter from Evin prison on Oct. 20th/08 and in this letter he has demanded human rights organizations not to forget all those who are behind the bars in the Islamic Republic for their support for human rights in Iran. He wrote: I'm being descriminated because i'm Kurdish and independent. U.N. concerned on Iran human rights! UNITED NATIONS (Reuters) – U.N. Secretary-General Ban Ki-moon on Monday expressed concerns about possible human rights abuses in Iran and urged the country to do more to combat discrimination against women and minorities. While praising Tehran for strides made in fields such as education and the provision of health services, Ban used a new report on human rights in Iran to list a number of areas where progress was needed. One of the minority groups suffering discrimination in Iran was the Baha'i community, Ban said. Baha'is regard their faith's 19th-century founder as the latest in a line of prophets including Abraham, Moses, Buddha, Jesus and Mohammad. Iran's Shi'ite religious establishment considers the faith a heretical offshoot of Islam. Baha'is say hundreds of their followers have been jailed and executed since Iran's 1979 Islamic revolution. Tehran denies it has detained or executed people for their religion. The Baha'i faith originated in Iran and claims 5 million adherents worldwide, including 300,000 or more in Iran. There have also been reports of "an increase in rights violations against women, university students, teachers, workers and other activist groups," Ban said in the report, which was issued to all 192 U.N. member states. He also reiterated U.N. concerns about the death penalty, including the execution of juveniles. "There were at least some cases of stoning and public execution, despite moves by the authorities to curb such practices," Ban said. "Cases of amputation and flogging and suspicious deaths and suicides of prisoners while in custody were also reported." The Iranian constitution prohibits torture but the country's penal code lacks a clear definition of torture as a criminal offense, Ban said in his report. Regarding the place of women in Iranian society, the report said criminal and civil laws contained "discriminatory provisions that are in urgent need of reform." Ban also said that gender-based violence was "widespread" in Iran. "Concerns have been expressed over an increasing crackdown in the past year on the women's rights movement," he said. One problem is that Iranian authorities sometimes link women's rights activists to "external security threats." A spokesman for the Iran's U.N. mission did not respond to a request for comment. Defenders of Free Expressions and Freedom of pen are arrested and detained in Iran ,daily violation of citizens rights in Iran! Khaled Ahmadian born in Pesveh close to the city of Piranshahr and Hasan Sardary born in Kermanshah are the two writers ( journalists and Kurdish researchers) who were arrested on Febraury 2007 are in ward number 12 of Orumieh city prison . They were arrested and detained without committing any crime and because of writing critical article. Khaled's family were able to put their house with the value of $150, 000 as bail and he was released on June 2008. But the family of Hasan Sardary were unable to bail him out because of financial difficulties , because the bail was heavy. Now his friend Khaled Ahmadian is asking all human rights organizations to help put pressure on Islamic Republic to release Mr. Sardary. This news was released on Oct. 17, 2008 by Doctor Golmorad Moradi who lives in Germany. The family of a Kurdish political activist requesting from all human rights organizations to ask the Islamic Republic security and judiciary official on the whereabout of their sons! The family of Yunes Badsar do not have any news and the whereabout of their son. Mr. Yunes Badsar was arrested on Fabrauray 2006 in the city of Marivan and upto know there are no news from him. Recently the Islamic Republic regime has intensified the arrest of political opposition in all over Iran,including human rights activists, labour rights activists , teachers rights activists ,students rights activists , women's rights activists, journalists , dissent clergies, religious minorities and national minorities. According to a news ( ? ) more than 60000 murdered bodies (IWC Will look into this in the future) have been found in Iran where the killer or killers havn't been arrested or brought to justice. 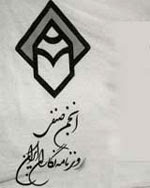 Logo of the "Association of Journalists in Iran"
The report also references 43 counts of violating "the right to judicial protection in court for ‎journalists," of which 2 cases deal with verdicts issued by the jury, 3 cases deal with press ‎violations examined in court, and 6 cases deal with issued verdicts. 4 cases concern the outright ‎ban on publications placed by the Press Oversight Committee (affiliated with ministry of culture ‎and Islamic guidance). Creating additional restrictions for Emaddedin Baghi in prison and ‎sentencing Bani-Taraf to 5 years imprisonment are among reports that are discussed in the ‎section dealing with "the right to judicial protection in court for journalists." Lawyers of "Bus Transit Union employees" sent a letter to deputy Judiciary Power about violation of Mr. Mansur Osanlu's human rights! Mr. Osanlu was arrested in January of 2005 because of his "Bus Transit Union" activities. Hi arrest, detention and interrogation was clear violation of the criminal code law and citizen's human rights .Mr. Osanlu spent eight months in temporary detention without trial and was released on bail in 2006. He was allegedly charged by the court of revolution behind closed door for " propagating against the system and actions against national security" and was sentenced to five years imprisonment. Mansur Osanlu was on his way to home, he had some union's leaflets when he was arrested and beaten by the Islamic Republic agents. Mr. Osanlu wrote a complaint against those agents and requested from prison officials to bring him to the hospital for medical examination which was denied by the agents.For almost 16 months in prison , he had only two times chance meeting his lawyers. Since his transfer to Rejaei shahr city prison Mr. Osanlu's visitation rights got worse. Mr. Osanlu suffers from heart problem and he has concern on his eye operation which needs medical treatment. The lawyers demanded their clients needs and rights be met while he is in prison. Freedom & democracy will prevail in Iran ! Reports that are coming from ward number # A in Isfahan prison indicate that; there are many business owners and youth who have participated in the strike of Isfahan city Bazar were arrested and brought to this ward. Ward "A " is the same as ward number "209" in Evin prison and it is controlled by the interrogators from the Ministry of Information. Upto now the family members of the detainees were unable to speak to their loved one.They do not have any information about their dears and they were also threatened by the prison officials. Many teachers from Yazd , Kerman and Semnan provinces who have been working for the Ministry of Education based on contract but havn't been officially employed by the ministry have gathered in front of the parliament to protest and demanded to discuss with MP's about their employment with the Ministry of Education. We must react to Ganji's comments. Recently the pro- government media has reacted to Ganji's comment about his question on the existance of 12th Shiite imam ( Imam Mehdi). the deputy commander compared Ganji with Salman Rushdie as a runaway person and his comment as an action against national security and an insult to the values of Islamic revolution. Hundereds of the Iranian pilots have migrated to the neighboring states! Jame Jam newspaper today Sunday quoting from Said Hesami the president of the Islamic Republic Airline ( Iran Air ) reported that :Hundereds of Iranian pilots for better salary have left Iran for neighboring states in Persian Gulf. Continuation of strike by business owners in Bazar; because of increase in tax ! Traditional concervatives against government . Continuation in closure of Bazar in Tehran. Human rights activist , journalist and writer Emad Baghi has been released from Evin prison! Emad has a record of arrest, summon and imprisonment. Upto now he has been summoned to the court for 55 times. Because of his critical writing in newspapers he was sentenced to one year imprisonment and was released this week.In the past because of his writings in reformist newspapers about chain murdering he spent three years in prison.He has written 27 books.Because of his efforts on capital punishment Emad has received the human rights award from France in 2004. He has also received the media award from Britain earlier this year . The comedy of the fake degrees among the Islamic Republic's officials! This time after Kordan the interior minister , three other officials including Mr. Motaki the Minister of Foreign Affairs degree is in question. 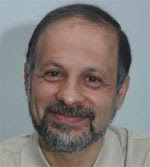 According to Shahab News, the events of the unknown degree ,master degree and fake honorary doctorate degree of Kordan the interior Minister of Ahmadinejad's Government has caused other cabinet members degrees into question and review .Because of all these , Kordan has resigned from the post of Interior Minister. Now ,doctorate degree of Mohammad Reza Rahimi , Ahmadinejad's parliamentary secretary has come under question. Several members of the parliament are investigating Ahmadinejad's cabinet minister's educational documents.Mr. Rahimi has denied any wrongdoing and threatened ,he might bring the MP's to the court , but despite of that ; the MP's calling him to respond how he has received his degree. Following these events; the educational degree of the third and high ranking official from the cabinet of Ahmadinejad came under suspicion. The MP's believe that Doctor Manuchehr Motaki the foreign Minister of Ahmadinejad has only grade 12 diploma. And the last but not least , the fourth cabinet member, Doctor Seyed Mohammad Jahromi the Minister of labour of Ahmadinejad came under investigation. One of the reformist MP asked Minister of labour to explain how and what year recieved his bachelor degree, master and doctorate degree.He was asked when he become the governor of Fars the document was issued in the name of Alinaghi Jahromi but now that he is the minister of Labour his name is Doctor Seyed Mohammad Jahromi. Watch the video clip.Its all about 70% of Iranian population. Expelled students rally ended with violence ! A group of students from public universities who have been expelled from universities and were deprived from education, together with students who are known as " students with stars beside their name " on Sunday morning gathered in front of the parliament in Baharestan square for a peaceful rally. But this peaceful gathering ended with violence by the confrontation of regime special forces and students. Strike by "Bazar" business owners! Several cities have joined the strike. In protest to Ahmadinejad's government tax policy, "Bazar" in the city of Isfahan, Shiraz, Tabriz , Tehran and Mashhad shut down their businesses. In protest to the execution of tax law by the government over "increase in values", the Bazar in the city of Isfahan was shut down. The gold and jewelry store owners in Bazar; in protest have chosen to close their store as the only way to protest Ahmadinejad's government tax policy. Now, other businesses like appliances and others have joined to the protest and shut down their businesses. One of the jewlery business owner said: The government is asking to add up another 3% tax from customers for the government and this is impossible for us to do.Right now we get less than 7% tax from customers. Ayatollah Montazeri to Ahmadinejad: Where is the freedom? The president has lied in America! Ayatollah Montazeri in "Eid Feter" at the end of ramadan for a gathering in his state where he is in house arrest have said: While in America the president have said ; "Freedom in Iran is more than any other countries in the world." The date of 20 November marks the day in 1959 when the Assembly adopted the Declaration of the Rights of the Child, and the Convention on the Rights of the Child in 1989, and is often the day chosen by countries as their own designated day to observe Universal Children's Day. Islamic Republic judiciary is planning to send this young man to the gallows! 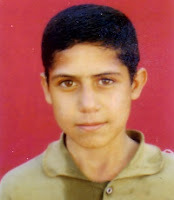 Mohammad Haddadi was 15 when admited committing the murder. On October 9 / 08 one day after World Childeren's Day he will be send to the gallows. Dont let this happen. Write your protest letter to Islamic Republic Judiciary. Islamic Republic has signed convention on child's rights in 1992. Article # 37 of the convention says: Childeren below 18 years of age shouldn't be sent to death or locked for life imprisonment. This news has been taken from the blog of Mohammad Mostafaei the childeren lawyer. Islamic Republic's Interior Minister Mr. Kordan admit his honorary diploma was a fake one! Did he buy it in a black market? How many other Islamic Republic officials or ministers have fake diploma and degrees from universities? On August this year Ali Kordan was chosen by Ahmadinejad as his Interior Minister and was introduced to the parliament for approval. MP's criticized Mr. Kordan for having fake honorary diploma from Oxford University. Apparently Mr. Kordan received his diploma eight years ago.Mr. Kordan released a copy of his diploma to media which was found out having forged signature of three professors.One of the Mp sent Kordan's diploma to Oxford. Then, Oxford reacted to Mr. Kordan's claim which made the situation worse for him.Oxford released a statement saying there is no name of Mr. Kordan as a honorary diploma recepient. Now he said his diploma was fake but he didn't know about it. Amazing woman and a mother !